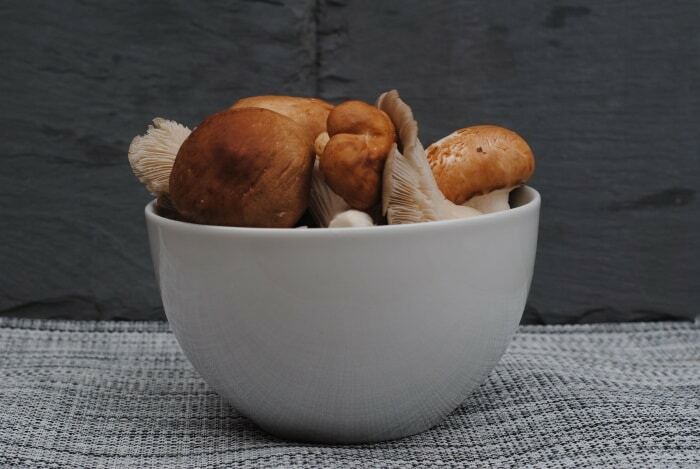 A rich and filling Creamy Mushroom Soup that uses a mixture of mushrooms. 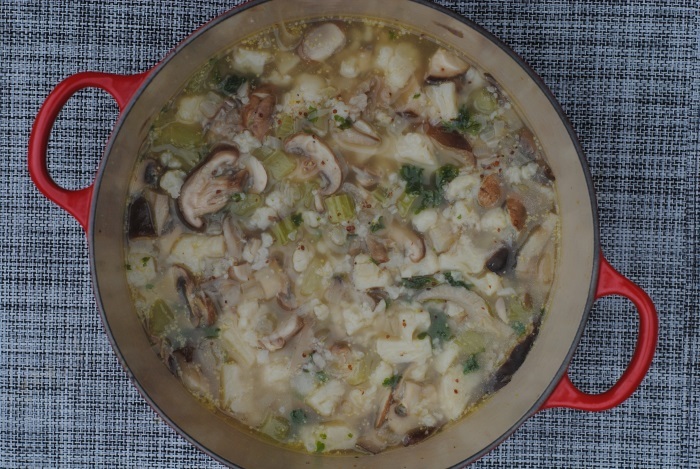 The addition of wild rice gives the soup a lovely texture. I know it is now technically spring and I have already started posting salad recipes, but I just couldn’t help myself with this one. Plus, hey, I live in the UK and with our weather there is every possibility that it could be soup weather in July. I may have just fulfilled the British stereotype by talking about the weather. It is Meatless Monday, so of course I have a new meatless recipe for you all. Anyone that has been a vegetarian, or is just a fan of vegetarian cooking knows that mushrooms play a key part in your food. I think it must be the almost meaty texture that vegetables just don’t really give you. One of the things I love most about mushrooms is how easily they bulk out a meal, with very few calories. Meaning, you feel like you are eating more, without having to eat too many more calories. Can you believe that a big bowl of this filling soup is just 220 calories and fat free as well?!?! Mushroom soup will always hold a special place in my heart. Whenever I was sick when I was little, my mum would make me mushroom soup. So, although it reminds me of being sick, it also reminds me of feeling better. It’s strange though, my mum is THE best soup maker (after my Nan of course), but she always bought mushroom soup. Sorry mum, just dropped you in it there. I continued this as well and always bought it as whenever I made it myself, it never came out right. It always went a bit grainy and something just wasn’t right. Until now! I have to say, I am loving my BRITA water filter. I keep it on my desk all day, which means I am drinking a lot more water and it tastes SO much better than straight out of the tap. But it’s not just good for drinking water, it is now the only water I will use in my cooking and I think filtered water is especially important in a dish like soup, as the water in an integral part of the meal. 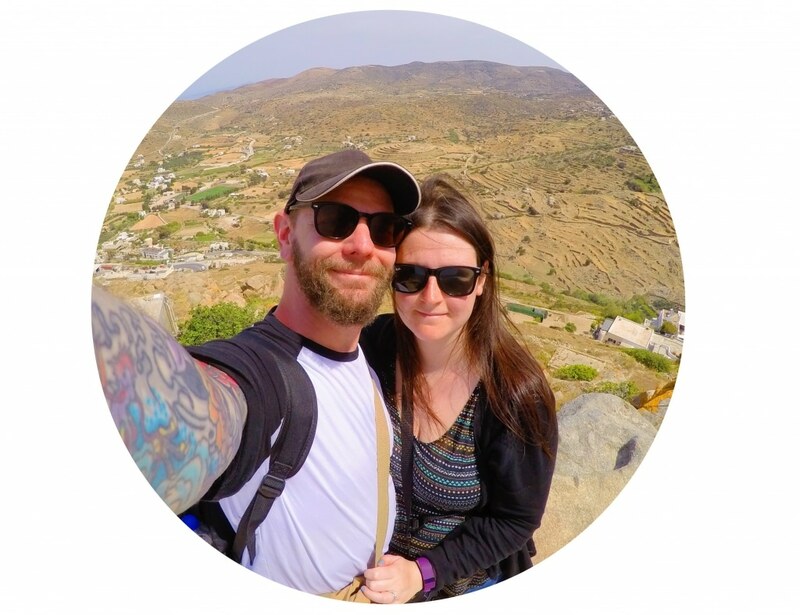 As a BRITA ambassador as part of their Better With BRITA campaign, I am spreading the word on the importance and difference of filtered water, which is something I am happy to do as I really do believe it. With BRITA’s filtration technology, it reduces the limescale and impurities that can change the taste of your water, and therefore your meal. Water is an important part of a healthy life, especially when exercising, so you want it to taste as good as possible. 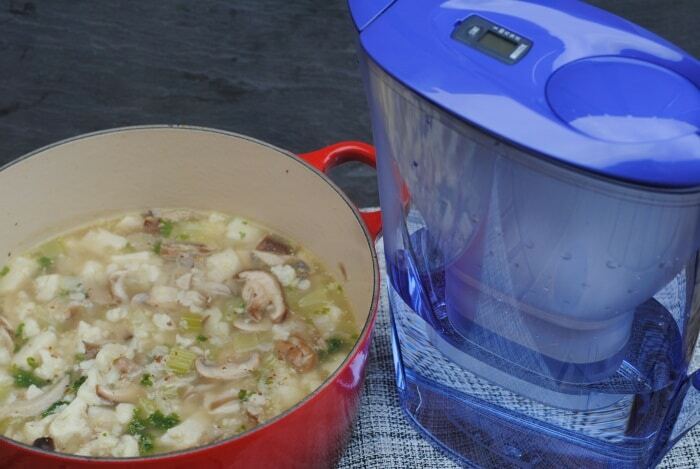 You can see lots of great food and drink recipes using filtered water, as well as some tips on drinking more water over on the BRITA website. 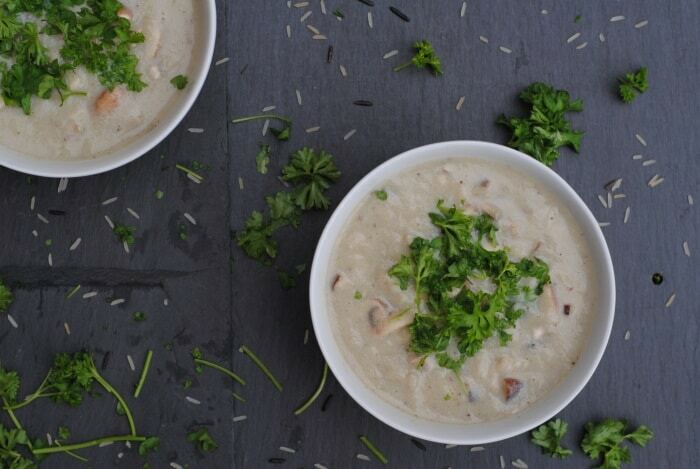 What makes this mushrooms soup a little different from most is that it has rice in it. I love carbs. I am just putting that out there, but I am sure you are all well aware of that. My stomach, and scales, are well aware of that too. There is not much that I love more than a steaming hot bowl of soup with a big chunk of bread fresh from the oven to dunk in to it. But, I am cutting way back on bread, so that just isn’t going to happen at the moment. But just a bowl of soup isn’t really a full meal, is it. So I added some rice in to this to make it much more of a filling and balanced meal. Add the rice to a pan of boiling BRITA filtered water and simmer for 25 minutes. Heat the oil in a large soup pan and add the shallots, celery and garlic and gently heat for 4 minutes. Add half the mushrooms and the cauliflower and cook for 4 minutes. Add the BRITA filtered water, mustard and parsley and simmer for 15 minutes. Mix the milk and cornflour together and put aside. Using a hand blender, blend the soup until smooth. Add the rest of the mushrooms, the cooked rice and the milk mixture to the blended soup and simmer for 5 minutes. This looks great. I love soup anytime – we eat it all year, just changing for the season and using in-season vegetables. I have some great chilled soups for summer! I can’t wait to make some gazpacho. I can imagine eating this soup on a winters night by the fireplace, watching a great movie. Nice recipe Dannii. The perfect way to eat it. I am feeling under the weather right now so a bowl of this soup would hit the right spot! I hope you feel better soon Pamela. I love Mushroom Soup! This looks so hearty and filling! This is my kind of soup – packed with flavour and really hearty! I’m still making soups too! Love mushrooms. Got to make this. 🙂 I like hot soups – chicken soup and going to make parsnip today! ooooh, parsnip soup sounds good! 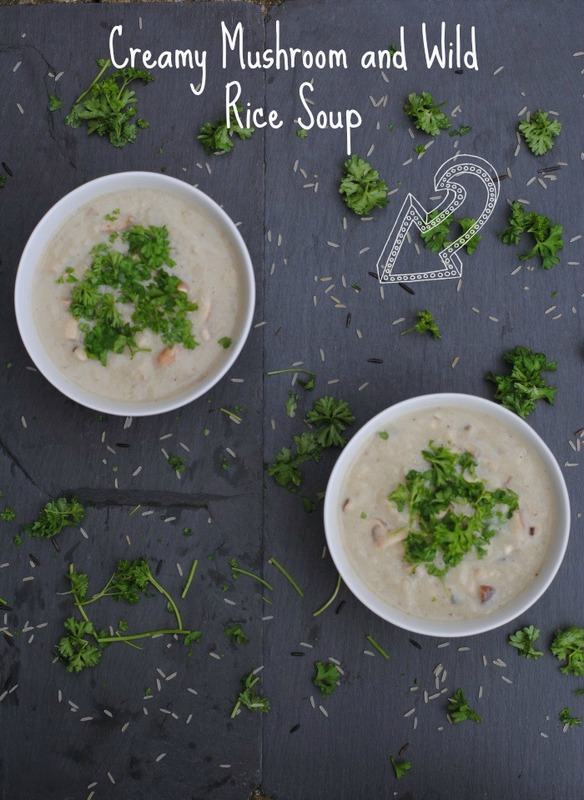 Lovely soup recipe and I’m a hug fan of wild rice. I really do need to invest in a BRITA water filter – thanks for sharing. It is helping me to drink so much more water. This looks absolutely amazing. I adore mushrooms and wild rice and combined they look fabulous. I am going to make this very soon. 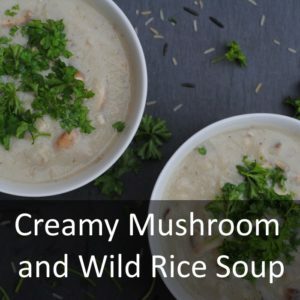 We love mushroom soup but I like the idea of adding wild rice.Also I am in love the background board. The rice makes it much more of a filling meal. I am a big fan of adding rice to soup too Danii, must try wild rice next time. It is so nutty I can see it working brilliantly with the mushrooms. It’s a really good combo. Looks so good, love mushrooms too. I reckon this would also work well without blending, as the previous shot looks utterly drool-worthy too! If you like a chunkier soup, then definitely. 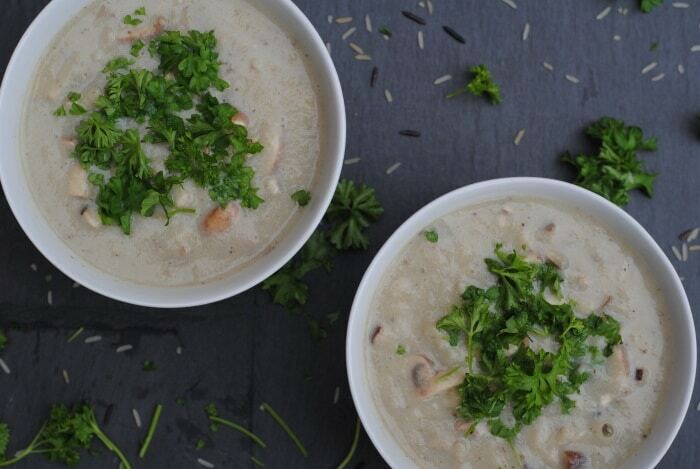 Rice in a mushroom soup is a great idea – love your pics with this recipe too. It’s that strange time of year for weather, isn’t it. I love mushroom soup myself. Sadly my other half hates musrooms, so I don’t get a chance to eat them too often – but I love a good mushroom risotto too. Thanks for sharing. This looks amazing, and I love that you’ve lightened it up. Looks really tasty! Lord above this looks insane! You’re right, mushrooms are a vital part to vegetarian cooking. I’ve been practically living off them for 8 years :’)! I practically lived off them when I was veggie. Thank you 🙂 Broccoli and stilton is another favourite of mine. What a lovely soup! Sometimes you just need that carb hit of rice, to save reaching for the bread bowl. I love the healthy creaminess of this. It’s all about the carbs for me haha.